Be the first to share your favorite memory, photo or story of Joanne . This memorial page is dedicated for family, friends and future generations to celebrate the life of their loved one. Joanne Kinsey, age 87 of Boone and the Eastern Star Masonic Home, died December 27, 2018 at the Eastern Star Home. Funeral Services will be Monday, December 31, 2018 at 10:30 a.m., at the Schroeder-Reimers Memorial Chapel at Sixth and Marshall, with Pastor Mike Carlson officiating. Burial will be in the Pilot Mound Cemetery in Pilot Mound. 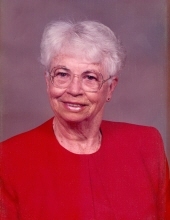 Joanne Helen (Parks) Kinsey, was born in Boone, Iowa on August 1, 1931, the daughter of Thomas and Hazel (Germer) Parks. She graduated from Boone High School in 1950. On June 5, 1949, Joanne married Vernon Kinsey in Boone. Over the years, Joanne worked as a bookkeeper for J C Penny of Boone, a bookkeeper and secretary for Goeppinger Enterprises of Boone, and bookkeeper for Diamond Vogel Paints in Ames. Joanne retired in 1997, but continued to work part time until 2010. Joanne and Vern enjoyed square dancing, playing golf, camping, and traveling. She also enjoyed bowling, snowmobiling, reading, gardening, and spending time with her family. Joanne was past president and past treasurer of the Boone Lioness Club, past president of the Boone Women’s Club, a member of the Magi Chapter and past Worthy Matron of the Order of the Eastern Star. She is preceded in death by her parents; husband; granddaughter, Kandace Kinsey; great grandson, Cody Kinsey; brother, Tommy; sisters, June, Charlene, and Shirley; a daughter-in-law, Linda Kinsey. Joanne is survived by a daughter, Sandra (Les) Clement of Boone; two sons, Charles (Cindy) Kinsey of Crane, Missouri and Douglas Kinsey of Stratford, Missouri; three sisters, Betty Kemmerer of Waterloo, Peggy Smith of Cedar Falls, and Jacqueline Sebring of Waterloo; three grandchildren, Seanna Smith, KiKi Schlitz, and James Kinsey; eight great grandchildren; two great -great grandchildren; numerous nieces and nephews. Friends may call at the Schroeder-Reimers Memorial Chapel on Sunday, from 2 until 8 p.m., where the family will be present from 6 until 8 p.m. On Monday morning, friends may call from 8 a.m. until service time. In memory of Joanne, memorials may be directed to the family. To send flowers or a remembrance gift to the family of Joanne Kinsey, please visit our Tribute Store. The family will be present from 6 pm until 8 pm. Visitation will be held from 8:00 am until the time of the service. "Email Address" would like to share the life celebration of Joanne Kinsey. Click on the "link" to go to share a favorite memory or leave a condolence message for the family.